Unlike other content filtering systems that use simple schedules with complete blocking of internet access based on time, the SafeDNS service uses a complex system of schedules that can be flexibly configured for any needs and any scenario. However, greater flexibility brings more complexity to the setup of a schedule. How a schedule works in SafeDNS: A Schedule in our service is made through settings Profiles, each with its own schedule. At the time specified as Active, the settings of the Profile will be applied and the rest of the time the settings of the Default Profile will be applied. 1. Turn off the internet on schedule, with the filtered internet in the rest of the time. This option is often used by parents to limit kids during school hours. 2. Filtering of unproductive websites in the workplace, with free access during lunch break, and before and after the work day. Obviously, this scheduling is suitable for use within organizations. 3. A more rigorous filtering in the hours when the computer is used by a child and a weak filtering (or lack of it) in the hours when the computer is used by adults. Now we will look at how to enable and set up a schedule, and then look at common scenarios of filtering schedule usage at home and in the organization. To set the schedule, you must create an additional profile on which we will enable a schedule. 3. Enter the name of the profile (e. g. 'Schedule profile'), and click 'Add'. After creating a profile, you can start setting up the schedule. 2. In the list of profiles (upper-right corner), select the newly created profile 'Schedule profile'. Note that the Default profile does not appear in the list because no separate schedule can be enabled on it. 3. Set the time in which profile 'Schedule profile' should be active. The rest of time the Default profile will be active. 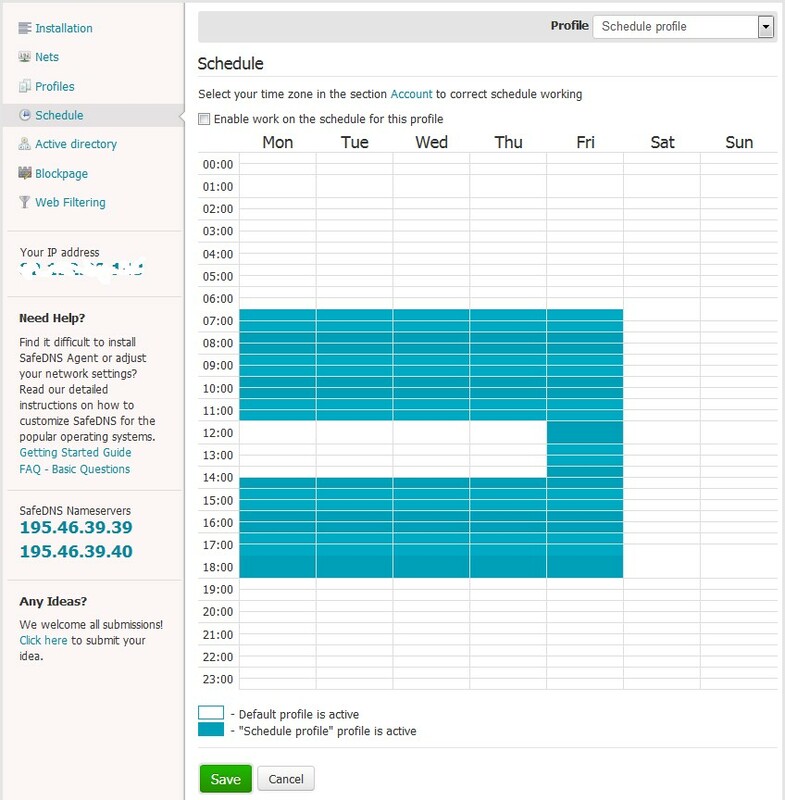 The appearance and functionality of the scheduler depends on your service plan. 4.Tick the checkbox Enable work on the schedule for this profile. After setting the schedule you need to apply it to your network or individual computers. If you use SafeDNS agent, then you need to enter into the program and select the created profile 'Schedule profile' and set it as the default. You can do this in Settings - Profiles by selecting the desired profile in the profile list and clicking the 'Set ' button. If you use an unattended installation of the agent to computers in a corporate network, you will need to reinstall it with the usage of the new profile with the schedule. If you configure filtering at the router, proxy or gateway, then you need to transfer your external IP addresses to the profile with the schedule. If your external IP address is dynamic, and you use a third-party dynamic DNS service, then instead of IP address you should enter the name of the dynamic host. Afterall the settings will be applied the schedule will start. You can have multiple profiles with different schedules for different users and networks, but note that the switch will always be between the current profile and the 'Default' profile. Scheduled settings switch at the wrong time. Make sure that you have the correct time zone applied. Enter the Account - Person, select the correct time zone and click 'Save'. The schedule works, but locking and unlocking occur with a delay. Due to the caching of DNS queries at the system level and in the browser, your computer can not immediately respond to the block or unblock issued by our service. To eliminate this, we recommend to disable automatic control of the browser cache. The schedule isn't working at all. Make sure that you have followed the above steps to configure the schedule. If everything is done correctly and the problem persists, contact our technical support.